Musician, manager, songs writer and much more from Shreveport (Louisiana)... First artist to reach the top of the Country charts, thanks to his action: Webb Pierce with "Wondering" in 1952. The following year it will be The Carlisles with "No help Wanted". In 1959, Johnny Horton with "The Battle of New-Orleans" and then, in 1962, Claude King with the all time hit "Wolverton Mountain". Principal compositions: "One Woman Man", "Honky Tonk Man", "Sink the Bismarck", "North To Alaska", "The Comancheros". A real memory of "The Louisiana Hayride", the great live radio show diffused from Shreveport each Saturday in the 50's, where he was, from 1957 to 1960, in charge of the Artist Service Bureau. Born on September 29, 1920, in Stamps, Arkansas, Tillman spent only two years there before his father, who worked for the railroad, was transferred to Shreveport, Louisiana. The family settled in Cedar Grove where Tillman will discover the music of Roy Acuff through his Dad's records and the radio broadcast of the Grand Ole Opry. The enthusiasm of his 14 years led to him thinking that he could sing as well as Roy and be a singer... A first guitar at 9 years old and friendship with other musicians lead him to sing in churches and hospitals for the pleasure of playing. A meeting which will make a great impression on him will be that of songster/bluesman Leadbelly playing on the streets of Shreveport with his 12 strings guitar and singing "Bow Legged Women". In 1939, he met Claude King and Buddy Attaway and they formed "The Rainbow Boys", playing where they could just for tips. They cut some demos and his recorded voice lead Tillman to forget about becoming singer. After the attack on Pearl Harbor, Tillman join the army and will back to the United States in November 1945. During his stay in the Pacific, he will start to play the bass fiddle and will meet Gene Autry and Pete Seeger. After some musical attempts in Dallas and Little Rock, Arkansas, Tillman returned to Shreveport in July 1947 when he joins "The Bailes Brothers". The following year, he done bookings for Johnny and Jack and Kitty Wells and will compose a few songs for them. He will help Hank Williams sr who had just joined the "KWKH" radio station to find his first engagements in the area. Thereafter, like many others, Hank will leave Shreveport to join the Grand Ole Opry on "WSM" in Nashville and became a legend. In June 1950, Tillman had the idea to give guitar lessons at J&S Music co. to improve his income. Among his pupils were the young Jerry Kennedy, Tommy Sands, Nancy Fautheree and Merle Kilgore. Tillman confess today than he doesn't have much to learn to such talented pupils. Anyway, it gave radio experience and exposure to them all except Nancy who will wed Jimmy Lee in 1952. In 1950, he started managing Webb Pierce who worked then for Sears and Roebuck. In spite of the opposition of Horace Logan, the director and producer of Louisiana Hayride, he helped Webb to be engaged in the show in November 1949. Webb will do his first record for "Four Star Records", at the beginning of 1950, with Tillman playing his doghouse bass. Soon Webb started his own label "Pacemaker" but, being under contract with Four Star, he will have his recording "The New Pan Handle Rag" issued under the name of Tillman Franks. In 1951, after having signed with "Decca", Webb will ask Tillman to become his manager. A contract of management for 5 years was signed, Tillman remaining also bass player of the touring group. Faron Young will join Webb Pierce band and will have his first recording titled "Hi-Tone Poppa" for the label "Gotham" set under Tillman's name. That in order to use the notoriety of Tillman in the area which was much larger than Faron's one way back then. In January 1952, "Wondering" by Webb will be no.1 in the charts and Webb will join, in September 1952, the Grand Ole Opry. That will put an end to his collaboration with Tillman as manager. 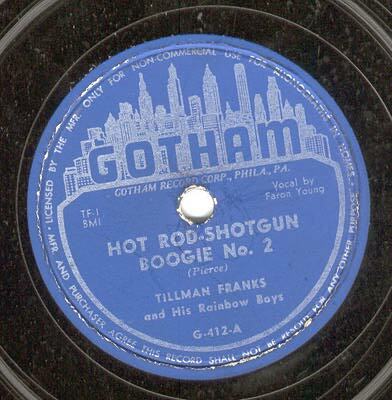 From then Tillman will take care of the career of Billy Walker and help Slim Whitman to find a manager. Slim will sign with the "Imperial" label and will make his first recordings for them in February 1955. In its turn Slim helped the young David Houston to obtain a contract with that label ... both will make the career we knows. . Returning at the beginning of 53 when Tillman became the manager/bassist of The Carlisles. They had already a hit with "Too Old to cut the mustard" and had just recorded "No Help Wanted". Tillman wrote all to his/her friends disc jockeys to push on air the record that became... n° 1 in the charts. In December 1953, when The Carlisles joined The Grand Ole Opry, Tillman and his family settled in Nashville. In May 1954, wearied by Nashville, Tillman will return to Shreveport and ... stay there to date. At this period, he will take in hand the career of Jimmy Lee Fautheree and Country Johnny Mathis. Via Stan Lewis, owner of a records store and talent-scout, Tillman will obtain for them a contract with the label "Chess" of Chicago. A first session in July 1954 will give birth to "If you don't, Somebody Else will" which will enter in the Cash Box Country Best sellers. Soon will follow for the duet bookings in Louisiana, Tennessee or Texas in such prestigious shows as The Big D Jamboree. They were an hot act until they broke and Wayne Walker started to team with Jimmy for a time. On October 16, 1954, Elvis will replace Jimmy & Johnny for one evening on the scene of Louisiana Hayride ... He will never leave until 1956 and that show helped to set the raise to fame for the "Hillbilly cat". During the year 1955, Jimmy and Johnny will turn with other artists in package shows organized either by Tillman or the KWKH and they will share the poster with Elvis, George Jones, Tibby Edwards, Charline Arthur, David Houston or Johnny Horton to quote only some names. It is Tillman which organized the concert of Elvis to the Cotton Club of Lubbock (Tx), January 06, 1955, the home town of Buddy Holly. Buddy and Bob will open sometime for Elvis or Bill Haley in 1955 and 1956. The same tour lead the wrong spelled "Alvis" Presley in San Angelo (Tx). Elvis and Tillman where at Wichita Falls (Tx), August 22, 1955, for a concert organized by Bill Mack, the famous radio DJ. Jimmy and Johnny (in fact Jimmy"'s brother Lennie) will later move on "Decca" and worked in Faron Young's backing band for one year. In 1955, he got a strong support to a young Jerry Naylor from San Angelo who started a professional career in radio (KPEP), television and as recording artist with The Crickets in the 60's. Always in 1955, Tillman will become after some reserves the manager of Johnny Horton which he knew since 1952. The first thing he made was to release Johnny of his contract with "Mercury" and to find to him, via an arrangement with Cedarwood (the musical publishing firm run by Webb Pierce) a contract with "Columbia". A first session will be organized on January 11, 1956 and, in order to go to in Nashville, Tillman and Johnny will borrow the car of David Houston's father. On the way, they stopped in Memphis and visited Elvis in Audubon drive. Johnny asked to borrow $ 10 from Elvis and if Bill Black could do the session. Elvis, who had not recorded yet for RCA, said OK to his friend's request. Grady Martin will be the producer of the session which will give "Honky Tonk Man", "I' m a one woman Man", "I'm Ready If You're Willing" and "I've got A Hole In My Pirogue". In May 56, "Honky Tonk Man" will be in the charts then followed "One Woman Man" in September 1956. The career of Johnny Horton was launched and others hits will follow like "The Battle of New-Orleans" who sold more than 2 million copies in few weeks. Johnny will be on the road during all these years with Tillman with the bass fiddle and Tommy Tomlinson with the guitar. They will frequently work with Johnny Cash and Tommy will often show some licks to Luther Perkins whose technique, though effective, was limited. On November 4, 1960, the trio took the road of Austin (Tx) for a concert in Skyline Club. That's were Hank Williams had made his last paying concert on December 19, 1952. There Tillman which had just undergone an operation did not play this evening during both or three sets which Johnny made. Johnny, amateur of spirits like his friend Johnny Cash, was persuaded that he would die of violent death being hurt by a drunk. Between the sets, he remained backstage lost in his thoughts. After the concert and a stop at the motel where they were staying, they took the road for the 220 miles drive to Shreveport. Johnny took the wheel for the return trip impatient to be back in time for the first day of duck season. Arrived close to Milano (Tx), towards 1h30 AM, their Cadillac was run up on a railroad overpass by a car drive by a student in a state of intoxication. Johnny was killed, Tillman and Tommy were injured. During his career, Johnny Horton had recorded several pieces written by Claude King, a long time friend. Some were: "She knows Why" and "Take Me like I am". After the death of Johnny, Claude King decided to take again his career as singer and, quite naturally, he asked Tillman to be his manager who had also in charge Billie Jean Horton. Claude King had already recorded for the label "Gotham" in 1949 and even cut a Rockabilly oriented song in 1956 "Run Baby Run» for Dee-Jay. Claude left his job and signed a 10 years term contract with Tillman. A recording contract with "Columbia" followed soon. His first success with "The Comancheros", composed by Tillman, was followed by "Wolverton Moutain", co-authored with the late Merle Kilgore. "Wolverton Mountain" entered the charts in May 1962 and will be elected song of the year. Unfortunately, divergences will lead to an end for the collaboration of the two friends 1963. Years later, they were reconciled and now live not far one from each other. Their wives are first cousins and sure enjoyed to see those old pals back together. Unfortunately, today, them old story ended. In August 1963, Tommy Tomlinson who had just lost one leg following the accident was in a difficult situation. Tillman suggested him to contact David Houston. Tillman had a song entitled "Mountain of Love" and was searching about somebody to interpret it. If David could record it, and if success should come, the situation could be nice for Tommy. A session was quickly organized and Tillman went with the recordings to Nashville. Al Gallico helped get the song on his way and to have a record deal. "Mountain of Love" entered the charts ensuring David Houston a success which had escaped him earlier on "Imperial", "RCA" and "Sun". In 1964, he was named artist of the year and will place 45 titles in the charts. For almost 22 years, Tillman managed him. David's biggest recording will stay "Almost Persuaded" and he sadly left us on November 30, 1993. During the Sixties, Tillman worked frequently with Billy Sherrill and Glen Sutton, two pillars of Nashville Sound of years 60/70. Glen Sutton will say of Tillman "Tillman is somebody of good which should be in Country Music Hall of Fame. I hope that one day they will awake and include him and understand that ". We can agree with such a statement! In April and May 1985, Tillman was with David Houston in England for the International Festival of Country in Wembley. Late in 1985, he will share for the first time his memories with us in "Roll Street Journal", the great English fanzine. In those days, we were just a few to enjoy vintage the Hillbilly Bop sound and Tillman's memories "blow off our overall" or "boppin blue suede shoes", depending if you were more in the "Hillbilly" or "Bop" sound! Here there's lots Œa thing we don't talked such: Tillman's collaboration with Shelby Singleton, Lefty Frizzell or Tommy Sands. His meetings with Texas T Tyler, Colonel Tom Parker, Jim Reeves, Sonny James, The Maddox Brothers and Rose or Hank Snow. His thousands of miles travelled through the United States, the hundreds of DJ's meet in order to promote the artists and their discs, an incalculable number of touring shows .... All that without a driving licence! Who would have believed it: In the kingdom of the car, Tillman had doing all that without ... a "driver licence". That even obliged to have a bus trip with Elvis in 1955. Definitely, we talk here about the life of a very special man full of talent. His book "I Was There When It Happened" is essential in all the libraries of the amateurs of Country, Hillbilly and Rock'n'Roll. You will have a backstage pass for all the country events from the 40's until today. You can get infos by consulting his site "www.tillmanfranks.com"
Tillman was the living memory of The Louisiana Hayride and could proudly stand up and say "I was there when it Happened". And, as I was not there when it happened, I had to give him a stand up ovation and said "Thanks" for your writing and talent. Tillman had shared is memories in the wonderful DVD produced by his friend Jerry Naylor and accurately titled "The Rockabilly Legends ­ a tribute to my friends". Here you will hear the true story right from the horse mouth. Tillman was a wonderful story teller and you can miss that DVD on www.rockabillylegends.com. Tillman may be gone he will never be forgotten until a country records will be played somewhere in the world. His legacy came to me who live oversea and I am glad to say: I knew a Country Music Legend! That's what he was and what he will stay ... Forever and ever, Amen!